Insurgent is the second book in the Divergent trilogy. It begins immediately where Divergent ended. There has been an uprising, the faction system is falling apart, and people must find allies anywhere they can. Is mostly vague and boring and pointless. If the job of a book trailer is to prepare you for what’s to come in a book, then this one does its job with aplomb. This book was a big disappointment. I really enjoyed Divergent, so I expected the pace of Insurgent to be similar, the relationships to be more developed and complex, and the action to be frequent and nail-biting. Alas and alack. In comparison, Insurgent is a real snoozefest. Often, the book reads like a five-year-old telling a loooooong, drawn-out, convoluted story (“And then . . . . and then . . . and then . . . and then . . .”). It jumps between various locations abruptly, leaves out crucial details, and lacks organization and structure. Much of the beginning of the book is focused on the romantic relationship between Beatrice/Tris and Tobias/Four, which is shallow, lame, and really boring. It didn’t go anywhere, and I didn’t care about it. Who should read it: People who read Divergent and got sucked into the series. This is NOT a stand-alone book. If you haven’t read Divergent yet, you should definitely not read this one. Haven’t read the first book yet? 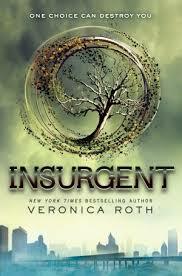 You can read my review of Divergent (the first book in the series) here. This entry was posted in Rating: 2/5 and tagged Book review, Books, Divergent, Insurgent, Tris, Veronica Roth. Bookmark the permalink.